Tanya Somerton Author, explains that there is a better way to get divorce. Tanya Somerton, Author, explains that there is a better way to get divorce. Tanya has been where you are now. Having endured the terrifying and complicated process of divorce, she used her experience to create the Ultimate Divorce Experience, and is now helping women survive their separations through her company. The jelly bean jar divorce advice. 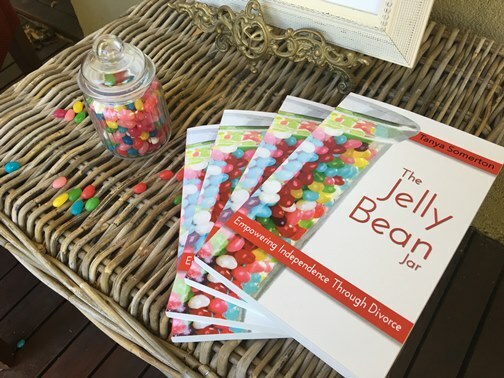 In The Jelly Bean Jar, Tanya reals her blueprint for a successful divorce, from dealing with professionals to save time and money, the questions you need to ask, and the tricks and tools to set yourself up for future success and independence. In this book, Tanya spills the beans on the money-making machine, and explains how to use your relationship breakup as the building blocks for your future relationships in order to find love and happiness. As a result of finalising a 22-year marriage and therefore finding herself starting out from scratch. It was dealing with the Divorce process in Australia that made Tanya Somerton realise the gap in the market. Due to Tanya’s determination and consequently looking for an efficient and streamline way of dealing with the legalities and financial protocol required to finalising her marriage. Hence, there seemed to be no arrangement of teamwork involved, and continually repeating her story was draining. Her team of professionals all worked independently, and therefore, never wanting to share information unless she paid. Furthermore making her circumstance even more grueling given what she was experiencing. Returning to work after 16 years at home with her three children and no knowledge of corporate life. She used the next seven years as a learning experience. As a result of living with an entrepreneurial spirit, she built the foundations and networks to expand her horizon. Using her salary to service mortgages, she purchased numerous investment properties around Australia. Tanya was featured in ‘Your Investment Property Magazine’ and in 2015 went on to become a qualified Mortgage Broker and started her own firm: www.tlcinvestmentgroup.com.au. Tanya’s trademark is ‘Turning dust into diamonds’ ethos and most noteworthy, unbiased teamwork. Every situation is completely different and treated with respect. Most of all, she takes personal pride in supporting her clients, As they deal with divorce and even greater pleasure providing a future framework to set them up for lifelong success. Her business funnel prevents any unnecessary mistakes, and there is not one thing she hasn’t thought of, including ongoing support groups and seminars. Tanya’s first book, The Jelly Bean Jar, is essential reading for anyone dealing with a Relationship Breakup. Packed with information regarding children, the legal process, accounting, financial services, counseling, future building blocks and most importantly mindset and forgiveness. Her own experience in this area and business knowledge. Tanya provides nuggets of information to help guide the reader through life’s most unexpected curveball. Now happily remarried, she lives with her dual Australian and World championship fishing husband. They travel Australia and the World finding beautiful places to dive and fish and appreciate the life they live.